THE SMALL BORE SPORTS BIKE. G-R-O-M: For anyone remotely familiar with the cultural revolution birthed by Honda’s 125cc sport bike, that simple four-letter word conjures thoughts of enjoyment and fun. An instant cult classic, the Grom has captured the hearts and throttle hands of riders of all sizes and ability levels through its unique ownership of the small-bore sport category. A major portion of its charm is due to its diminutive stature, which is friendly to new riders, offers nimble handling, and is an absolute blast for carving turns. The pint-size Honda’s lightweight feel and peppy powerband contribute to its broad appeal, while the big-bike-inspired styling turns heads in every environment. With a four-speed transmission, manual clutch, and disc brakes, the Grom is as serious as it is delightful. The Grom’s LED projector-style headlight not only looks great and is a major styling element, but it also provides superior illumination. 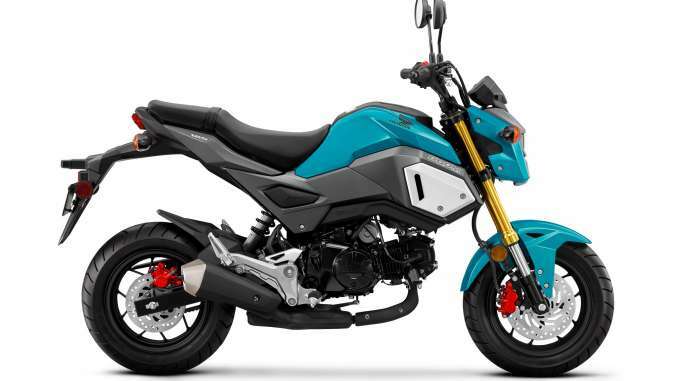 Sharp bodywork, a LED headlight and cowl, a low-mount muffler and sweet new colors keep the 2019 Grom looking cooler than ever. 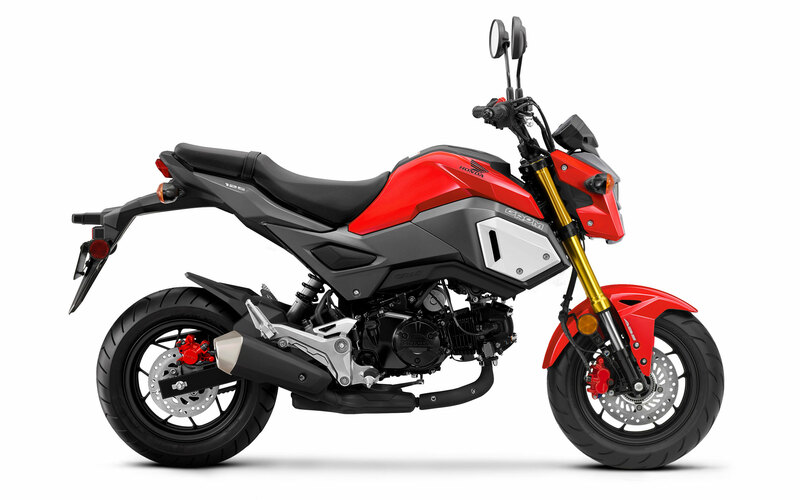 Honda’s Anti-Lock Braking System (ABS) is available on the Grom, which helps you make confident stops under less-than-ideal conditions. •Single-cylinder 125cc SOHC four-stroke engine packs a perfect blend of performance with impressive fuel efficiency plus accessible and fun all-around ability. •The engine uses low-friction technology such as an offset cylinder and a roller rocker arm for the valve gear. •Programmed Fuel Injection (PGM-FI) offers excellent throttle response over a wide range of riding conditions by continuously monitoring several variables to ensure the correct fuel mixture for the existing riding and atmospheric conditions. •The four-speed gearbox is managed via a manual clutch and offers smooth and consistent gear changes. •Integrated fuel tank and side panels with an edgy look. •Under-slung exhaust, upswept tail unit. •Compact chassis features a sturdy mono backbone steel frame. •Telescopic inverted 31mm fork (like on a full-size motorcycle) delivers 3.9 inches of travel. •Steel box-section rear swingarm and a sturdy single shock yield 4.1 inches of comfortable rear-wheel travel. •Single front 220mm disc with hydraulic dual-piston caliper and single rear 190mm disc with hydraulic single-piston caliper deliver strong stopping power. •Compact 47.4 inch wheelbase and light curb weight of 225 pounds results in amazing agility to boost rider confidence. •LCD digital dash includes speedometer, odometer/A&B trip meters, clock and fuel gauge. Curb Weight* 234 lbs. 229 lbs.